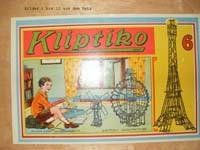 Kliptiko metal construction sets, made models out of hollow tubes using special clips to join them together. It was made in England from the early 1910s till the Second World War. The instruction manual for Kliptiko. The USA patent for Kliptiko. Various photos of the Kliptiko construction system.